There are 19 finalist of Miss Nepal 2017. The contestants were selected by auditions held in various cities all over Nepal. For the first time in the history of the contest, this year, Skype auditions were also held for the applicants living abroad. This year, contestants from Kathmandu, Dharan, Pokhara, Butwal, Dhangadi, Biratnagar, Nepalgunj and Chitwan are contesting for the crown. The contestants were selected based on the talent, beauty, personality and the level of wisdom among the applicants. In the pre-final round 30 contestants were selected by eight different audition. Eleven contestants were eliminated to finalize the finalists. The final is scheduled to be held on June 2, 2017.
Who are the Miss Nepal 2017 contestants ? The official list of the Miss Nepal contestants is yet to be released. I have compiled the list of contestants from unofficial sources. Unlike previous years, the organizers chose 30 contestants to begin with and then they eliminated 10 contestants as they progress. The final 20 contestants will compete in the finale. I am compiling the list of 20 finalist contestants. The following list is the confirmed finalist according to the individual contestants. Miss Rai 2012 beauty pageant is going to be held on Ashad 23, 2069 (July 7, 2012). Miss Rai contest is organized by Kirat Rai Sanskritik Kendra. The contest will be held in Rastriya Nachghar in Jamal, Kathmandu. The event starts at 2:00 PM on Saturday July 7. We already have various ethnic beauty contests like Miss Newa, Miss Gurung, Miss Sherpa, Miss Tamang and so on. It seems such ethnic contests haven’t been able to include all the sub-ethnic communities. That might be the reason Miss Jyapu is going to be organized soon. Jyapu is a small sub-community within Newa or Newar community, opting agriculture as their profession. By default, Miss Newa is supposed to include all the beauties from Jyapu community. ants will be taught about the traditional agricultural practices and typical Newari tradition. After Miss Jyapu (agriculture professionals) it seems, we will have more beauty contests like Miss Gubhaju (Newari Priests), Miss Shrestha (Merchants), Miss Pode (fishermen, sweepers), Miss Chyami (sweepers) and so on in the near future. 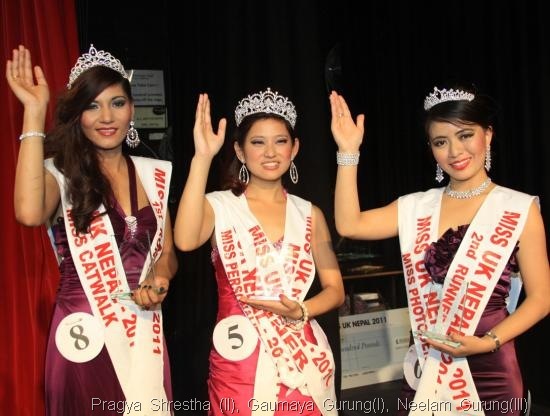 Congratulation Miss UK Nepal 2011 Gaumaya Gurung. The 19 year-old winner Gaumaya Gurung lives in Watford, London and is 5ft 2in tall. Also, congratulations to Pragya Shrestha the first runner-up and Neelam Gurung the second runner-up. The event was organized on November 19, 2011. A beauty and talent contest among the girls aged 6-12 years was held in Pokhara recently. The winner among the 9 contestants was Miss Tushar Dube. The first runner up of the contest was Miss Ishma Gurung and second runnerup was Pringja Gurung. Ishma was also the Most Confident and Pringja also received the Best Cultural Dress title. I wonder if they had some more titles and they didn’t have contestant to award the title. Miss Kajol Khadka has become the Miss Air Hostess after defeating 21 contestants in an event held at the Rastriya Naachghar in Kathmandu. Kajol has received Rs. 35,000 in cash along with the Miss Air Hostess title. All the contestants were the students taking Air Hostess training at Flight Tech International and Flying Institute. The whole event was simulated as an actual flight in "SA 101 of Sangrila Airlines". The captain of the 1:30 hour flight from Kathmandu to New Delhi was Captain S. Shrestha. ha received the prize money of Rs. 25,000 and Rs. 15,000 respectively. Kajol has acted in the leading role in her upcoming movie "Deshle ragat maage." The movie is directed by Badri Adhikari. 20 year old Miss Air hostess, Kajol Khadka, is 5.4” tall and weighs 48 Kg. She is doing her first year in Bachelor in Business Studies (BBS). Sadichha stood out in Miss World ramp with peacock feather dress. In the Miss World modeling round, the audience clearly gasp and applaud when Miss Nepal 2010, Sadichha Shrestha, opened up her peacock feathered dress (skip to 1:30 in the video below to see it for yourselves). The dress was made out of Allo from Taplejung district in Nepal with peacock feathers attached to it. The designer of the dress are Uttam Banepali and Shiba Shrestha of Uttam Creations, Kupondole. The dress weighing 6 kg took 5 workers for 15 days to finish. In a contest organized on October 10, Dipika Pahari was crowned Miss Teen Pokhara 2010. A 10th standard student, 15-year-old Dipika, was the youngest among the the 15 finalist. The first runner up was Sarala Thapa and second runner up was Sanju Thapa in the contest. Miss Teen Dipika was also the winner of Best Creative title. Sanju was also the Miss Photogenic. shma Subedi – Miss Smart, Merika Gurung – Best Dress, Asmita Gurung – Best Discipline, Purnima Rana – Miss Cjharming, Ayusha Buddharchya – Best Hair, and Anju Singh Khawas – Miss Attitude. After a long time Miss Teen Pokhara is going to be held this year. The contest was halted previously amidst protest of Maoist women groups. Our Mustang has nothing to do with Ford car or horses. It is a beautiful place in Northern part of Nepal and that was where the Miss Mustang event was held. In the second Miss Mustang beauty contest held recently Jyoti Thakali was selected the Miss Mustang 2010. 21 year-old Jyoti had to defeat 12 other participants to win the title and receive a cash prize of Rs. 15,000. The first runner-up of the contest Dipika Lalchan received Rs. 10,000. The Miss Mustang 2009 Khusbu Lalchan crowned the new title winner in the event.